Nokia Lumia 510 officially announced – another budget marvel? Nokia has unveiled its next super-cheap Windows Phone for the emerging markets – but it's stuck on last season's platform. 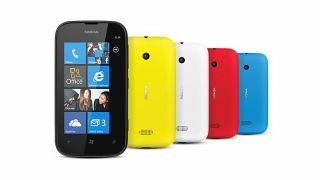 The new phone will be launched with Windows Phone 7.5, but at least there will be a choice of five colours at launch. The expectation was that the new phone would at least be popping out with the 7.8 iteration of Microsoft's platform, but it seems Tango will be sticking around for a while in the absence of Windows Phone 8. In terms of specs, we're looking at a device that's running an 800MHz single-core CPU, a WVGA touchscreen (that's curiously coming in at 4-inches, making it larger than the Lumia 610) but here's the bad news: only 4GB of storage, of which apparently only 2.2GB is actually usable, although you do get 7GB of SkyDrive storage from Microsoft. The rest of the specs are as you'd imagine on a Windows Phone handset, meaning 3G, GPS and Wi-Fi are all present and correct, along with a 1,300mAh battery. The new phone will initially be going to the emerging markets, such as South America, India and China, but sadly we've had confirmation from Nokia that this phone won't be launching in the UK, with no word on launches for the US or Australia. We've also got no word on price, as you'd expect for something seemingly not destined for these shores – but given that the Lumia 610 is a much more attractive proposition when it comes to spec (the screen size aside) we wouldn't recommend you lose too much sleep over this one.